Julie I must say you should go for an exhibition at your locals.. which may include, your paintings, photographs and a screen which plays video, speaks about your work and also you can actually get buyers for your work. Trust me am not trying to impress you or make you blush but I actually respect your work and talent. Please find out local exhibitions management and give it a try. This painting doesn’t look like a painting though it looks like a photograph.. Hats off to you Julie. In between where are you from? Thank you. It is something I have thought about a lot and I think it may be something I can get together sometime this year and I will let you (and my other beautiful people on here) know what happens! I would really love to do that. And most of my work is in other people’s hands, so it’s really a matter of my time creating more works and trying to get advertising happening, but it is definitely something that is going to happen! I need to find a place that will print my photographs and hopefully I can get some consumable items (like tote bags with my work on them and prints, even little originals if I feel generous) for people to buy at the exhibition. I am really keen to do it! 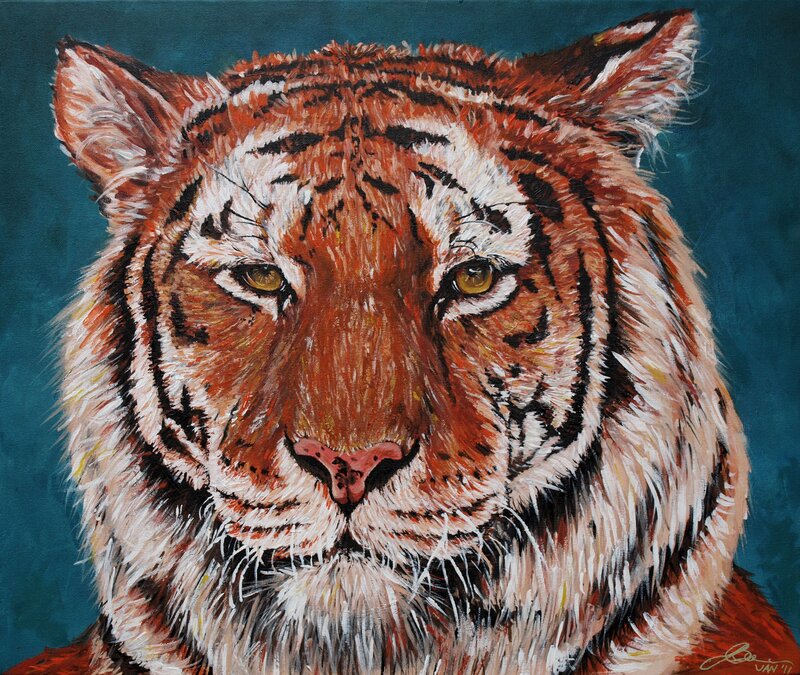 As for the tiger painting, it is definitely a painting, it took a few weeks to complete! And it was my third REAL attempt at painting (even though I’ve done it since I was in preschool!). Thank you! No, you’re right. Definitely. I will do my best! These are the things I love and it would be fantastic to make them happen. We’ll see how we go and I’ll try to get into contact with more people who can help me. I’m a novice so far but I know there’s plenty more for me and I will be exhibiting in the near future. All the best to you, you’re really wonderful to me already. Take care! Thank you again for sharing so much inspiration on your own blog too. It’s great to see. Speak soon!